Journalist and researcher Cynthia Joyce is well aware of the ephemeral nature of information on the web. In her book, Please Forward: How Blogging Reconnected New Orleans after Katrina, she drew from both the live web and the Wayback Machine to comprehensively survey the blogging community in New Orleans during and after Hurricane Katrina. In 2016 Joyce got in touch with the Internet Archive and Archive-It about creating a collection of these posts so that they remain accessible on the web as well as in her book. 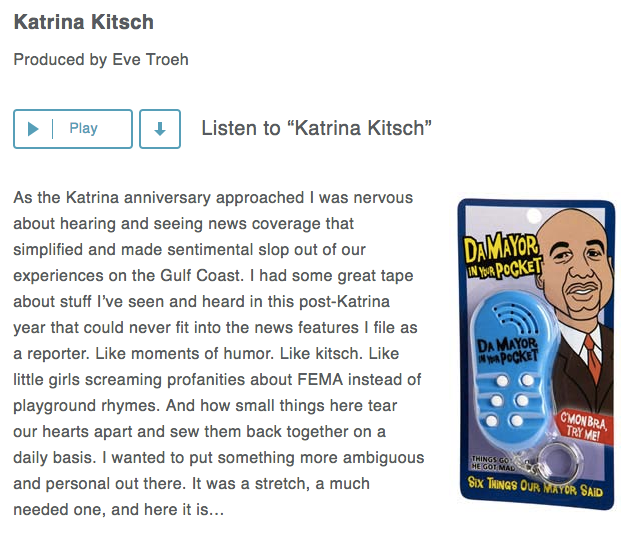 That collection can now be found here: Hurricane Katrina blogs web collection. I had a chance to chat with Cynthia about her book, the significance of documenting voices of people who lived through Katrina, how the Wayback Machine played a role in her research, and why it was important to her to document these posts in an Archive-It collection. Sylvie Rollason-Cass: What sparked the creation of this book? I wanted more than anything for this book to capture what it felt like to live through that specific, epic moment. It probably was a little masochistic, deliberately weeding through so many of those memories. But as the tenth anniversary was approaching, I felt like if traditional media was going to force me to relive this horrible event every anniversary, I at least wanted a more emotionally accurate account, one that felt true to my now fading memory of it. SRC: How did the Wayback Machine play a role in your research? CJ: Without the Wayback Machine, this research would not have been possible – it was really the only reliable conduit to 2005. Even if I had been able to access specific blog content from individuals who knew where they’d moved to, or who had saved copies somewhere, I would not have been able to follow the ways in which they were connected, which was key to creating a narrative from that time. SRC: Your book acts as a sort of analog Wayback Machine for the blogs you reference, why was building a web archive collection of these blogs with Archive-It important? CJ: I feel like that material deserves to be discoverable again — easily searchable, and in an online format. And because we’d ‘unearthed’ much of the material from the lost web, and resurfaced it here, the majority of the work in the book is reflected here – just not in any specific narrative order. SRC: Has writing this book changed your perspective on the nature of information on the web? CJ: I tend to think that blogging was to Hurricane Katrina what Twitter was to the Arab Spring — it was the perfect tool for the time. 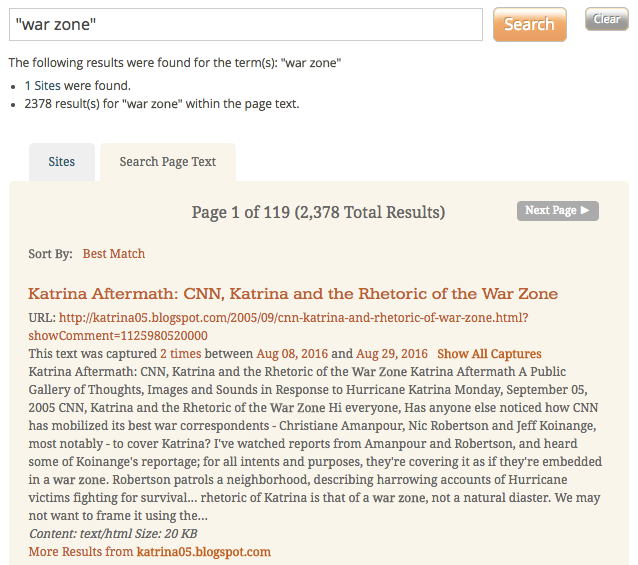 In the case of Katrina, blogs wound up providing a real sense of “place” for many of the displaced. We don’t feel that so much on the Web anymore – that sense of having a home page — the emphasis now is all on keyword searches and social media streams. But back then, having an online hub, with a permanent web address, was so reassuring, especially when your actual home was destroyed or inaccessible. Also, I allowed a lot of my research to be organic—I was very deliberately trying to “surf” through those times in the same way that you might have in 2005 – 2006, before social media directed so much of our attention, and before websites were deliberately written and “optimized” to game Google’s search engines. One of the most enjoyable parts of the process for me was experiencing a real sense of serendipitous discovery—something that I no longer associate with the web today. SRC: What would be your advice for other scholars and researchers using web archives in their work? Learn to love spreadsheets! That way you can be more methodical than I was in making notes and keeping records as you pore through the material.